Fun Fact: My Mom's dog is a Chow Chow! There's a book I have called Batman and Philosophy in which one of the essays examines whether Batman's decision to not kill the Joker is causing more lives to be lost. Depending on the mood I'm in, I'll waver between, "Don't sacrifice your morals and break your one rule!" to "Oh, just kill him already and be done with it!" But Bruce Wayne won't ever pull a trigger, even in the name of Justice. All Batman villians must laugh when shooting their henchmen. It's just tradition at this point. Yeah, that's right, Batman: Harvey Dent will get your dirty work done. Good thing about leaving things to the Fate of a coin toss: it's really good at absolving guilt. The good portion of Harvey's psyche decices to emerge and punish criminals under the mantle of "Janus." He's pretty darn close to being a superhero, too: he dons a mask of the Greek god Janus and some black robes and starts punishing criminals and righting wrongs, and even twarts Two-Face's plans to destroy the city, becoming his own nemesis. I could get used to this. C'mon, say it out loud, you know you want to: SHFF!! Oh, and slap people around, too. 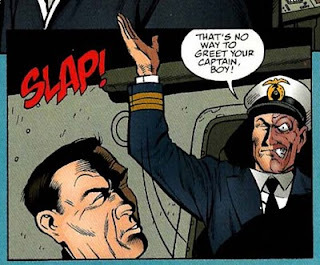 If anyone at DC is looking for a "new" angle to take Harvey Dent in, instead of the hoodie-wearing-betrayed-by-his-own-gang incarnation, you could always revisit this. Just don't forget the military uniform, okay? 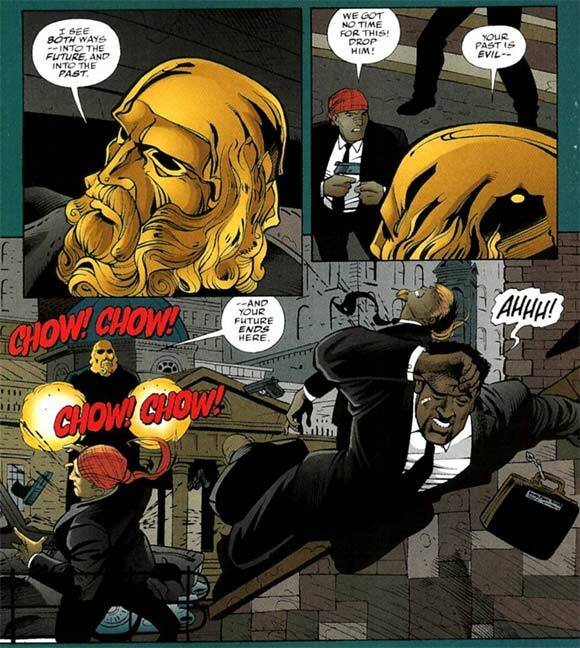 The idea of Harvey as Two-Face's arch rival is a really sweet idea! Until someone at DC backtracks and picks it up I'm just going to sit and brainstorm uses for "Shff!' - That sucker has untapped potential! It can't be easy to be your own nemesis, but I'm sure that Harvey will manage to pull it off somehow. And with style. Style is something Harvey Dent isn't short on, that's for sure! He looks nice in a hat. He should wear one more often.